You are currently browsing the tag archive for the ‘hair style’ tag. i know Cinco de Mayo has come and gone, but i wanted to share my hair style for that day anyway since it is the season for color. plus, who doesn’t want to add a lil’ extra somethin’ to their summer wardrobe with a few faux fleurs? 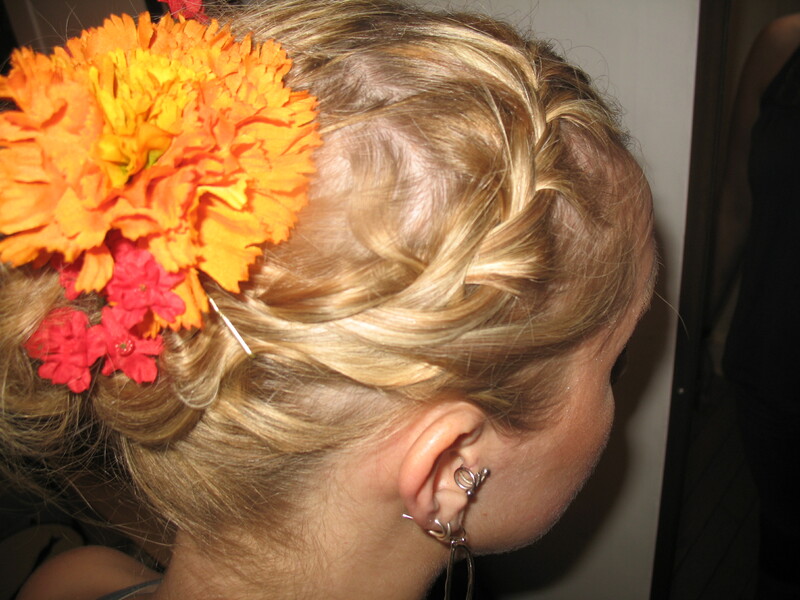 part your hair to the side by making two french braids, Lauren Conrad-style, around your head. pull back into a loose, messy ponytail with the help of bobby pins. then place flowers (don’t buy anything too heavy and remember to cut the stems short!) sporadically throughout the bun, pinning them in so as not to have a weeping willow effect later on in the night. spray with a gentle hold hairspray and terminar! (that is spanish for finish, right?) you’re ready to sip on margaritas in the sun.